ABOVE: This aerial view of Meersburg shows the Upper Town, the Lower Town, and the harbor on the Bodensee. The word "picturesque" has become a travel cliché, but in the case of Meersburg, it's a legitimate adjective. Meersburg is a split-level resort: The lakeside Lower Town is home to the boat and ferry landings, a lakefront promenade, hotels, restaurants, bars, and sporting activities; and the Upper Town is a hillside cluster of historic buildings, museums, galleries, cafés, shops, and vineyards. Both sections of town have remnants of medieval walls (including two ancient gates), and you can go back and forth between the two by stairway or road. 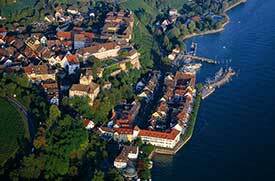 Meersburg is easily the kind of resort where you can spend several days without getting bored. Museums include the Old Castle (with guided tours year-round), the New Castle (with Baroque rooms, art exhibits, and the Dornier Aviation Museum), the Bible Gallery, a Town Museum, the Wine Museum, and even a Zeppelin Museum that complements the larger Zeppelin Museum Friedrichshafen. When you've had your fill of looking at museum displays, you can play miniature golf, go hiking, rent a rowboat or pedalo, cycle or skate along the lake, or sample Meersburg's swimming pools and thermal spa. Meersburg also makes a pleasant hub for excursions around the Bodensee, using lake steamers and car ferries. The "flower island" of Mainau is a quick trip by boat, and Friedrichshafen (the largest town on the lake's northern shore) is just a couple of boat stops or an easy bus ride away. For more information about Meersburg, including hotels and restaurants, visit the city's multilingual Web site at www.meersburg.de. The Restaurant und Weinstube Zur Haltnau is a pleasant lakeside restaurant with indoor and outdoor tables where you're likely to find more locals than tourists. Try the fish, which comes from Lake Constance. Top and 1st inset photos copyright © Meersburg Tourismus.